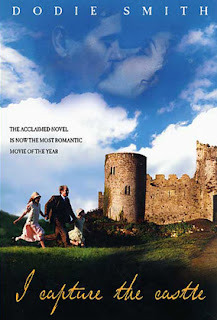 I first read I Capture the Castle by Dodie Smith back in 2007. (I hesitate even to link back to my original review, but here you go. I must be honest!) I think I was just starting to figure out how to write reviews in 2007. (Have I mentioned before how much I dislike my old reviews?) At any rate, back in 2007 I said that this was a "Take it, or Leave It" sort of read. I don't know that I'd necessarily change that assessment, but I can say that I enjoyed the story much more thoroughly the second time around. The only reason I picked this one up again is because it was selected as my in-town bookclub's book for the month of March. Berlinerinpoet picked it. She had looked up my old review and therefore knew I had read it. I was honestly glad that she choose it because I've always suspected that this was a book that I was supposed to like and just didn't, for whatever reason. I was curious to see what a re-read would do to my opinion. Re-reading this one definitely changed my opinion. I Capture the Castle tells the story of seventeen-year-old Cassandra and her family, who live in not-so-genteel poverty in a ramshackle old English castle. Here she strives, over six turbulent months, to hone her writing skills. She fills three notebooks with sharply funny yet poignant entries. Her journals candidly chronicle the great changes that take place within the castle's walls, and her own first descent into love. By the time she pens her final entry, she has "captured the castle"--and the heart of the reader--in one of literature's most enchanting entertainments. Cassandra has a sister, Rose, who hates poverty with a passion. When two well-to-do American men arrive on the scene and take up residence in a neighboring estate that they had recently inherited, Rose is bound and determined to marry the family out of their state of want. Cassandra rather naively talks of Rose's antics, as well as others in the household. At least, you feel at first that she is naive. This book, however, is a coming-of-age tale in which we find Cassandra growing in maturity as the story progresses. There are a few surprise twists in the plot and so I don't really care to say much else about the book itself. I will only say that a very conservative reader might not appreciate the looseness of morals which are present within this story. As one lady from our bookclub pointed out, this book is a little like The Great Gatsby in that the characters are all doing 'what is right in their own eyes.' A high degree of selfishness can be found within these pages which is sometimes frustrating and oftentimes bewildering. But for Cassandra, I would really rather dislike this read. Because she exists though, I found it to be something of an amusing pleasure. * If the name Dodie Smith rings a bell, it might be because she is also the author of 101 Dalmations (linked to my thoughts) which, of course, was made into one of Disney's greatest animated films. * Dodie Smith was born in England in 1896. She lived in America during the 1940's and it was while she was living here that she penned I Capture the Castle. Prior to writing this book, she was a playwright. This book marked her crossover from playwright to novelist. I'm very glad @Lisa writes... made that comment. I watched the movie too and didn't care for it, but I ended up liking the book (minus the father...naturally). Good to know I wasn't alone. I missed the boat on this one...didn't like it much at all. One of the few. Oh well. I've always meant to read this one and 101 Dalmatians. One day I will! I really enjoyed this one and wasn't necessarily expecting to. Didn't know about the movie; I'll have to check that out! I'm really hoping to be able to watch the movie. I've been meaning to check our library to see if they have a copy. Rather pricey on Amazon and, unfortunately, not available to rent on their either. We don't have Netflix. Next up? Blockbuster, I guess! I'm rereading this book- my first read was 10 years ago and I find it as funny as I did then (it's one of only two books I remember laughing out loud at- the other being The Watsons Go to Birmingham 1963). I think it is brilliantly written and while, yes, the father is quite pathetic, it doesn't take away from the story for me.